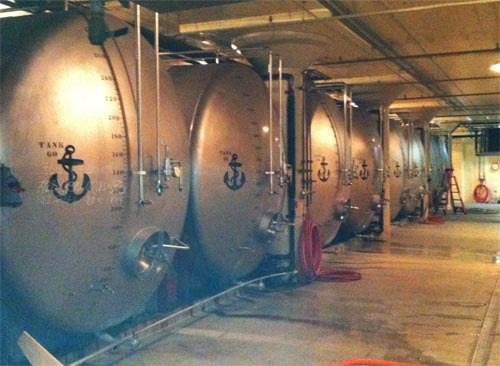 Ales and lagers are both aged in cellar tanks like these at Anchor Brewing, but lagers require cooler temperatures and longer aging periods. First, the beer question. It’s all beer no matter what you call it. Beer is the all-inclusive description for an alcoholic beverage made from malted grain and fermented by the addition of yeast. As for ales and lagers, simply put, it’s the yeast. Ales are fermented using a top-fermenting yeast, usually a strain of Saccharomyces cerevisiae. They are fermented warm, often at 60 degrees Fahrenheit and above, sometimes as high as 75 degrees Fahrenheit. After fermentation, ales do not require long cellar aging. The high fermentation temperatures create fruity and estery characteristics that are commonly balanced by higher hopping rates. Lagers, on the other hand, are fermented with a bottom-fermenting yeast, a strain of Saccharomyces pastorianus, sometimes known as Saccharomyces carlsbergensis. These fermentations are kept much cooler (typically between 40 and 50 degrees Fahrenheit), take longer, and produce a beer that requires cellar aging at near-freezing temperatures. This can be anywhere from a few weeks to a few months. The term ‘lager’ comes from German and means ‘to store’ or ‘storage.’ This cool fermentation does not impart the stronger flavors associated with ales and the hop rates are much lower and subtler. Usually. Having said this, I should point out that there are lagers that mimic ales in all respects and there are ales that are indistinguishable from fine lagers. And there are now styles that cover everything in between. There are other beers, most notably some of the Belgian varieties, that use different yeasts or combinations of yeasts. These beers can have all sorts of interesting characteristics, but they all are top-fermenting and are considered to be ales. But if you are settling down with a good pint of beer whether pale or dark, mild or strong, ale or lager, and it’s an enjoyable experience, the difference doesn’t seem to matter. is this where the mighty Danish brewery gets it’s name or vice versa? Vice versa. The scientist who first isolated and described the yeast was on that brewery’s payroll, and named it in honor of his employer.